SVP28R is part of our metallized heat seal bag line. 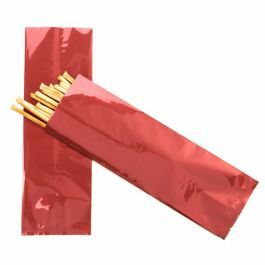 Measuring 2 x 8 inches in size, this metallic red flat pouch is ideal for packaging items like ground coffee, granola bars, trail mixes and more. Made from 2.6 mil food safe material, this bag provides the highest barrier protection from UV lights, moisture and oxygen. Heat sealable for ultimate freshness. 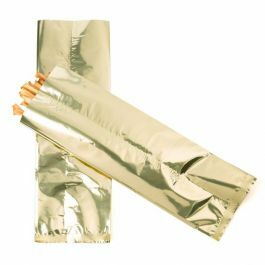 Our line of metallized heat sealable bags are available in a variety of sizes and colors , making them perfect to package almost any item. SVP28R is the smallest in the line, measuring 2 x 8 inches. 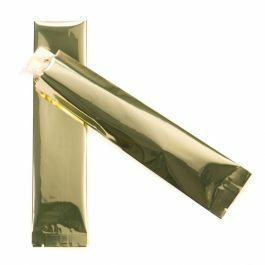 This flat pouch is ideal for packaging food items like granola bars, dried fruit, powdered mixes and more. Constructed with 2.6 mil food grade material, this bag offers our highest barrier protection against UV lighting, moisture and oxygen. Heat seal using a hand sealer for freshness and a secure closure. Easy-to-tear notches on either side of the bag allow for instant enjoyment of your product. 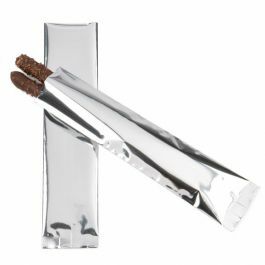 Our SVP28R is ideal for packaging single-use items like powdered mixes and snack foods.